All of Zhang Chun Hua's damage is considered to be the target losing health. Whenever the number of cards in Zhang Chun Hua's hand falls below the number of units of health that she has lost thus far, Zhang Chun Hua can draw cards until she has as many hand cards as she units of health missing. This ability does not go into effect during her discard phase. There are some situations in which Zhang Chun Hua draws cards from "Mourning" that are not intuitive. For example, if Zhang Chun Hua uses a Peach to heal herself, "Mourning" is activated before the health is recovered. For example, if Zhang Chun Hua has two hand cards and one unit of health and she uses Peach, she draws one card instantly, so she then has two cards and two units of health. "Mourning" goes into effect before the Peach goes into effect. Also, if Zhang Chun Hua is on the brink of death and saves herself with a Peach, she then draws until she has three cards, as Mourning supplies her with cards until she has X cards in her hand (X being three), but this power does not go into effect until Zhang Chun Hua is saved from the brink of death. Note that "Unfeeling" is enforced. Zhang Chun Hua cannot choose to not activate this ability when she causes damage to another character. "Mourning" can be activate when Zhang Chun Hua loses hand cards or when her health level is decreased. If Zhang Chun Hua kills a rebel, she does not draw three cards. 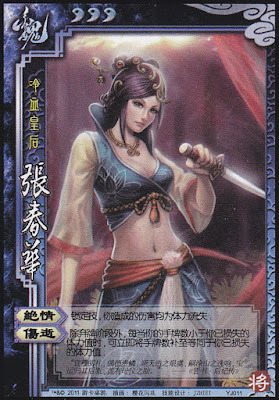 Conversely, if Zhang Chun Hua is the king and kills her loyalist, she does not discard all of her cards. Zhang Chun Hua never causes elemental damage. Therefore, she never activates Chains damage. Zhang Chun Hua can damage characters with Wood Armor. The Wood Armor prevents damage from regular Attacks, but the character wearing the armor still has to respond to Fire and Lightning Attacks. If they fail to Escape, they are hit by the Attack. If Zhang Chun Hua is the source of one of these Attacks and they fail to Dodge, they receive negligence damage. Similar logic can be applied to Blaze. If Zhang Chun Hua damages a character wearing Wood Armor with Blaze, they receive one unit of negligence damage (fire damage was never dealt to this character). Ice Sword The specific wording of the description of this weapon ability states that when the Attack causes damage, the wielder can prevent the damage and discard two cards. Zhang Chun Hua's damage is all negligence damage, so she cannot cause actual damage from her Attack. Ancient Scimitar Since all of Zhang Chun Hua's damage is negligence damage, the Ancient Scimitar will not activate against another player with no hand cards. As a result, Zhang Chun Hua will not cause an additional unit of damage when she lands an Attack in a situation like this. Longbow The Longbow can be used to discard an equipped horse if the Attack causes damage. Zhang Chun Hua only causes negligence damage, so she cannot discard horses when using this weapon. Cao Cao Evil Hero Cao Cao cannot place cards that damage him in his hand if Zhang Chun Hua is the one who played them. Sima Yi Feedback Sima Yi cannot take a card from Zhang Chun Hua if she causes him damage. Xiahou Dun Unyielding Xiahou Dun cannot flip a judgement card to force Zhang Chun Hua to take damage or discard cards. Guo Jia Bestowed Rouse Guo Jia does not get to draw two cards for each unit of damage that Zhang Chun Hua causes to him. Xun Yu Eternal Loyalty Xun Yu cannot refill someone's hand when Zhang Chun Hua damages him. Cao Pi Exile Cao Pi cannot flip a character when Zhang Chun Hua damages him. Cao Zhi Wine Poems Cao Zhi cannot flip back over to the upright position if he is flipped and Zhang Chun Hua damages him. Yang Xiu Chicken Bone Yang Xiu cannot force Zhang Chun Hua to not play or discard a card type when she damages him. Xun You Wisdom and Foolishness Xun You cannot draw a card when Zhang Chun Hua damages him. Ma Su Bottomless Tears Zhang Chun Hua does not have to discard all of her cards if she kills Ma Su. Fa Zheng/New Fa Zheng Grudge Zhang Chun Hua does not need to give Fa Zheng a heart card if she damages him to avoid receiving a unit of negligence damage. Likewise, New Fa Zheng cannot force Zhang Chun Hua to give him a hand card for each unit of damage that she deals him. New Xu Shu Speechless The damage that Zhang Chun Hua deals to New Xu Shu via tool cards is not prevented. Xiao Qiao Fantasy Xiao Qiao cannot discard heart cards to pass damage caused to her by Zhang Chun Hua. Bu Lian Shi Memory When Zhang Chun Hua kills Bu Chen Shi, Bu Chen Shi can allow Zhang Chun Hua to draw three cards and recover one unit of health. "Unfeeling" bypasses this stipulation of "Memory." Chen Gong Delayed Wisdom Chen Gong can be damaged multiple times during Zhang Chun Hua's turn. Additionally, she can use non-delay tool cards on him after she damages him. Zuo Ci New Life Zuo Ci cannot acquire a new character card when Zhang Chun Hua causes him damage. Cai Wen Ji Lament Cai Wen Ji cannot flip a judgement card when Zhang Chun Hua damages someone with an attack. Cai Wen Ji Heartbroken Zhang Chun Hua does not lose her abilities if she kills Cai Wen Ji. Hua Xiong Reliant on Valor When Zhang Chun Hua damages Hua Xiong with a red Attack or an Attack with Wine, Hua Xiong's maximum health limit is not reduced. God Guan Yu Fighting Soul Zhang Chun Hua does not acquire a Nightmare Token when she damages God Guan Yu. God Zhuge Liang Heavy Fog God Zhuge Liang's "Heavy Fog" does not protect him and his allies from negligence damage. God Cao Cao Tribute God Cao Cao cannot draw a card from each player's hand when Zhang Chun Hua damages him. God Lu Bu Violence God Lu Bu does not get Rage Tokens when Zhang Chun Hua damages him. God Sima Yi Command to Endure God Sima Yi does not get Endurance tokens when Zhang Chun Hua damages him. "Unfeeling" provides Zhang Chun Hua with a counter to some of the most powerful characters in the game, including most demigod characters. "Mourning" is a great defensive power, as it can be activated when Zhang Chun Hua uses/loses hand cards and when Zhang Chun Hua is damaged. It also gives her protection against card destruction tactics. "Unfeeling" is not without weaknesses, many of which are outlined in the 'Clarification' section. When a character chooses Zhang Chun Hua, they cannot guarantee that any of the characters she counters will be present in the game (unless the king has chosen one of them) or if any of her enemies will choose these characters. Ma Dai - Ma Dai can reduce Zhang Chun Hua's maximum health when he damages her with an attack, reducing X for "Mourning." King Zhang Chun Hua is a good king choice. "Unfeeling" protects her from losing all of her cards in the event that she inadvertently kills a loyalist, and the extra unit of health definitely benefits "Mourning." However, there are problems with this choice. Zhang Chun Hua does not get to draw three cards for killing rebels and the rebels will be sure not to pick characters with powers bypassed by "Unfeeling." Loyalist Zhang Chun Hua may be a good loyalist, depending on the king and rebel picks. If the king is Cao Cao or Cao Pi, she would be a horrible pick, as she could not activate their powers when she inadvertently damages them. However, if the king is not one of these choices and the rebels have damage activated abilities, Zhang Chun Hua is powerful. However, she still has that weakness of not being able to draw three cards when killing a rebel. Rebel Zhang Chun Hua seems to be a good rebel pick, again, if her enemies have chosen characters she can counter. She has the advantage of knowing who the king chose, so if the king is Cao Cao, Cao Pi, or another character with a damage-activated ability, she will be a major threat to them. Otherwise, her "Unfeeling" power will not be very useful. Spy Zhang Chun Hua seems to be a mediocre spy pick. Like the loyalist role, the spy role requires Zhang Chun Hua to kill rebels. Unlike any other choice, Zhang Chun Hua does not get the three card bounty for doing this. Zhang Chun Hua is a powerful character. She is a counter to many powerful characters with damage-activated abilities. However, as stated previously on this page, there is no way for Zhang Chun Hua to guarantee that her enemies will have these types of abilities. Zhang Chun Hua is strongest when she has only one unit of health remaining, as she always has two hand cards (three if she is the king with five or more people in the game). As such, if you have one unit of health remaining, it is often a good idea to keep a Peach in your hand at the end of your turn instead of using it to increase your current health level.